ICT is often promoted as a solution to a range of social ills. This is particularly true for the use of ICT in developing countries. ICT deployment can address numerous issues but its overall aim is the empowerment and emancipation of individuals with the aim of improving society. This chapter takes a critical approach to such discourses and asks which claims to emancipation are raised and how they are underpinned. 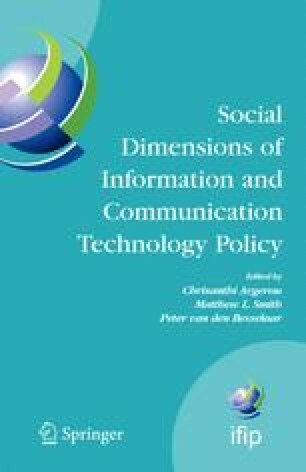 Using a Habermasian framework, the chapter undertakes a critical discourse analysis of the Egyptian ICT policy. This important document, which has inspired much African ICT policy, is analysed to identify the validity claims it raises. These claims, many of which are explicitly aimed at emancipation and empowerment, are then contrasted with social realities as well as the overall structure of the policy document. This comparison shows that empowerment is not only not achieved, but arguably not a primary aim of the policy in the first place. Instead, claims to empowerment are used to legitimise particular aims which conflict with empowerment. The chapter concludes with a critical reflection of the chosen approach and findings.